Citation Information: J Clin Invest. 2001;107(12):1591-1598. https://doi.org/10.1172/JCI12242. ADP plays a critical role in modulating thrombosis and hemostasis. ADP initiates platelet aggregation by simultaneous activation of two G protein–coupled receptors, P2Y1 and P2Y12. Activation of P2Y1 activates phospholipase C and triggers shape change, while P2Y12 couples to Gi to reduce adenylyl cyclase activity. P2Y12 has been shown to be the target of the thienopyridine drugs, ticlopidine and clopidogrel. Recently, we cloned a human orphan receptor, SP1999, highly expressed in brain and platelets, which responded to ADP and had a pharmacological profile similar to that of P2Y12. To determine whether SP1999 is P2Y12, we generated SP1999-null mice. These mice appear normal, but they exhibit highly prolonged bleeding times, and their platelets aggregate poorly in responses to ADP and display a reduced sensitivity to thrombin and collagen. These platelets retain normal shape change and calcium flux in response to ADP but fail to inhibit adenylyl cyclase. In addition, oral clopidogrel does not inhibit aggregation responses to ADP in these mice. These results demonstrate that SP1999 is indeed the elusive receptor, P2Y12. Identification of the target receptor of the thienopyridine drugs affords us a better understanding of platelet function and provides tools that may lead to the discovery of more effective antithrombotic therapies. Representative aggregometer tracings of washed platelet aggregation experiments showing the interactions of ADP and epinephrine. (a) Wild-type platelets were treated with 1 μM epinephrine (top curve) or 2 μM ADP (bottom curve). 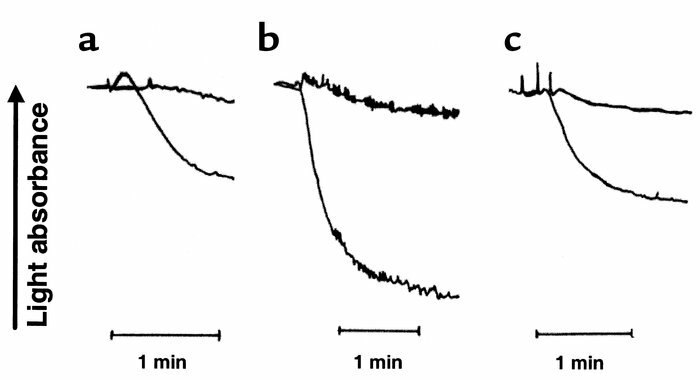 (b) SP1999-null platelets were treated with 1 μM epinephrine (top curve) or 0.3 U/ml thrombin (bottom curve). (c) SP1999-null platelets were treated with 2 μM ADP (top curve) or a combination of 2 μM ADP and 1 μM epinephrine (bottom curve). Platelets from four mice were pooled and resuspended in modified Tyrode’s buffer supplemented with 1 mM aspirin and 200 μg/ml fibrinogen for each experiment. Aggregation was determined using a Chrono-Log aggregometer. Each experiment was performed three times with similar results.